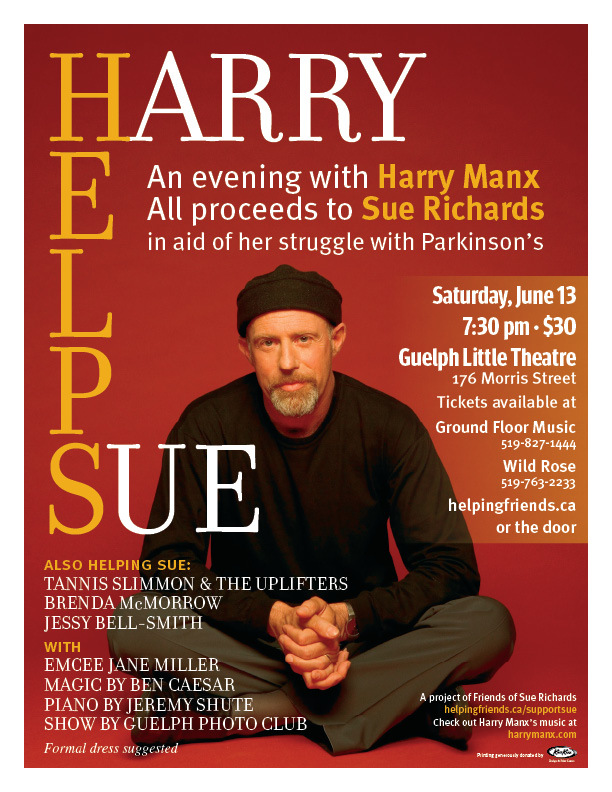 Harry Manx is coming back to play to Guelph for a special show to help artist Sue Richards in her battle against Parkinson’s Disease. Sue, a founder of Hillside and ArtJam, is also well known in Guelph as the creator of both Blog Guelph and the Breast of Canada Calendar. The show takes place on June 13 at Guelph Little Theatre. Also on the bill: Tannis Slimmon & the Uplifters, Brenda McMorrow, Jessy Bell-Smith, with emcee Jane Miller, magic by Ben Caesar, piano by Jeremy Shute and a photo exhibition by the Guelph Photo Club. Formal dress suggested as it’s a pretty special night. June 13 at 7.30 p.m.
Tickets are $30 and available at Wild Rose 519-763-2233 and Ground Floor Music 519-827-1444 or online at www.helpingfriends.ca. You will also be able to get them at the door if they last that long! A project of Friends of Sue Richards. Check out Harry Manx’s music at www.harrymanx.com. Culture Vultures, Daniel and Lynn were back in the studio for our monthly trip around the Guelph Art Scene on May 6. Great fun, as usual. There must have been something in the air as we were decidedly giddy this time around. Cool music, fun events. Hope you enjoy it. This month we had one special group pick, Harry Manx Helps Sue. Blues Guitarist Harry Manx will be back in Guelph for a special concert for good friend of Royal City Rag, Sue Richards. Sue is battling Parkinson’s Disease. As an artist she doesn’t have the benefit of the health insurance policy those of us more fortunate often take for granted. The show takes place at Guelph Little Theatre on June 13 at 7.30 p.m. Also on the bill: Tannis Slimmon & the Uplifters, Brenda McMorrow, Jessy Bell-Smith, with emcee Jane Miller, magic by Ben Caesar, piano by Jeremy Shute and a photo exhibition by the Guelph Photo Club. Tickets are available at Wild Rose 519-763-2233, Ground Floor Music 519-827-1444 or online at www.helpingfriends.ca. You can learn more about our individual picks for the month below. Guelph MusicFest – Guelph Youth Music Centre from May 10 – May 22 . Friday Noon Concert Series – Downtown Guelph puts on a series of concerts in St. George’s Square from noon until 1:00 p.m. every Friday from June 12 through September 18 . Words That Sing, Eden Mills Writers Festival Fundraiser – The 21st season of the Eden Mills Writers’ Festival takes place on Sunday September 20. On Sunday, May 31 (at 2:00 p.m.) at the Norfolk St. United Church there is a fundraiser featuring readings by Michael Ondaatje, Jane Urquhart, and Leon Rooke. Tickets are available for $20 ($15 for students) at The Bookshelf. Jenn Grant with Jessy Bell-Smith – Thursday, June 11 at 9.30 p.m., Carden Street Cafe, 40 Carden St.; $10 tickets; reservations recommended (519)837-2830. As part of the very successful fundraiser for Guelph artist Sue Richards on September 13, 2008, Guelph Arts Council announced that it is in the process of establishing the Guelph Arts Council Artist Relief Fund to assist local artists who are dealing with debilitating health issues. The creation of this fund is in response to a growing community realization of the plight of self-employed artists whose health can leave them unable to work and, unfortunately, also unable to collect employment insurance or other government benefits. For some time, Guelph Arts Council, in its role as a resource to and advocate for artists in the Guelph area, has been exploring opportunities to provide emergency financial assistance to artists who find themselves in this unenviable position. Now, thanks to a recent anonymous donation, Guelph Arts Council is able to move forward on this initiative. A partnership is being established with The Guelph Community Foundation who will manage the fund, and detailed criteria are being developed. Eventually, the annual interest from this fund will be used to make awards. Anyone interested in making a donation or obtaining more information should contact Guelph Arts Council at 519-836-3280 or gac@sentex.net. For more information about Guelph Arts Council and its role in the community, visit www.guelpharts.ca/guelphartscouncil. Kudos to the Guelph Arts Council for setting this up.